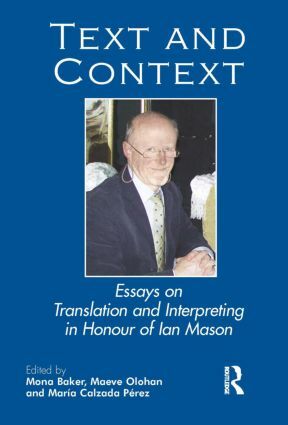 Ian Mason has been a towering presence in the now flourishing discipline of translation studies since its inception, and has produced some of the most influential and detailed analyses of translated text and interpreted interaction to date. The sophistication, dynamism and inclusiveness that have characterized his approach to all forms of mediation are the hallmarks of his legacy. Text and Context celebrates Ian Mason's scholarship by bringing together fourteen innovative and original pieces of research by both young and established scholars, who examine different forms of translation and interpreting in a variety of cultural and geographical settings. In line with his own inclusive approach to the field, these contributions combine close textual analysis with keen attention to issues of power, modes of socialization, institutional culture, individual agency and ethical accountability. While paying tribute to one of the most innovative and influential scholars in the field, the volume offers novel insights into a variety of genres and practices and charts important new directions for the discipline.